Spring has brought new life and a flurry of activity to Illinois’ ravines. The trees and brush that climb their banks have budded green with fresh growth. And heavy rain has sent water coursing through the ravines’ stream beds and out into Lake Michigan. Some of the ravines in this area are publicly owned and managed, others private. But they all face the same threat of stormwater erosion. This can lead to muddied slopes, damaged property, and increased pollution flowing into Lake Michigan. 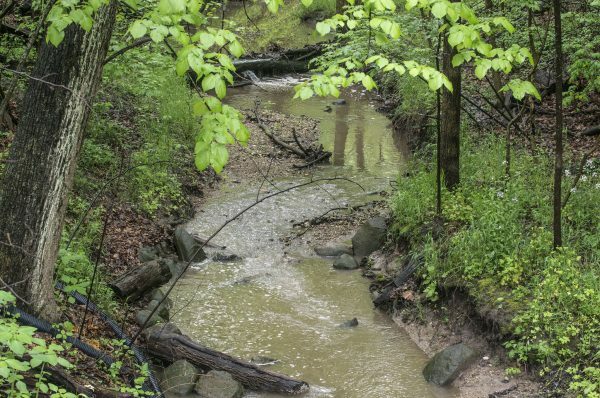 While this is a serious problem, the neighboring communities of Glencoe and Highland Park are taking action to fight erosion and revitalize the ravines. The Alliance for the Great Lakes is working with both communities, partner organizations, and restoration experts to bring people together to protect the ravines. It was long thought that the area ravines were too degraded to support aquatic activity like fish spawning, but a determined group of ravine advocates refused to accept that. A number of the ravines in Highland Park are publicly owned and managed by the city’s park district, which has created a unique opportunity for collaboration around revitalizing the ravines. They’ve partnered with schools, community groups and like-minded organizations like the Alliance to improve the ravines and restore them as a viable fish habitat. The Park District partnered with the local Gary Borger Chapter of Trout Unlimited to install natural dams and contour the walls of the ravines to control the flow of water and improve the fish habitat. 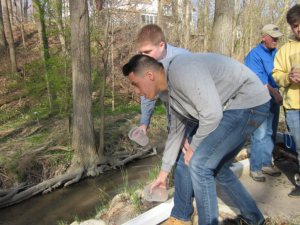 This spring, students at Highland Park High School raised trout as part of a hands-on ecology lesson. Last month, in the first real test of the ravine waters’ habitability, the students released the young fish at Rosewood beach. In addition to freeing their fish into the ravines, students learned the basics of fly fishing from Trout Unlimited volunteers and examined macroinvertebrate specimens with staff from the Highland Park Heller Nature Center. This cross-collaboration is just one way the Park District of Highland Park is working to build community around ravine stewardship. In Glencoe, 100% of the ravines are privately owned, so the Village’s Sustainability Task Force is reaching out to individual homeowners. 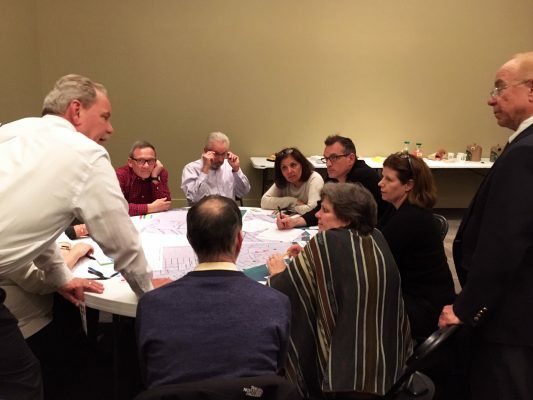 Last month, the Alliance teamed up with the Task Force to host a workshop that brought ravine residents together and connected them with tools to protect their property—and the health of the ravines. Identifying the early signs of erosion and destabilization can be very difficult. And, the longer the problem goes untreated, the harder and more expensive it is to fix. So, the Alliance is putting folks in touch with the resources they need to be proactive—like restoration experts, landscape architects and engineers who can provide expertise and guidance. These types of firms usually survey property for free and can play a vital role in stabilizing the ravines. To make matters more complex, different options for improving the infrastructure of the ravines don’t always work together. And because homeowners share the ravines with their neighbors, what one neighbor does on their property can negatively impact another. That’s why the Alliance is bringing people together to ensure that these efforts benefit not just one homeowner, but the health of the ravine as a whole and all those that share it. It’s important that ravine residents consult with experts early and continue talking to their neighbors. Participants left the workshop feeling energized about coming up with ways to do just that. The Alliance is excited to work with these homeowners to build a community where people can learn from each other and work together to manage their incredible shared landscape. Here at the Alliance, we’re bringing people together from across sectors to support communities as they work to improve their ravines. We look forward to continuing to work with communities on the North Shore to protect these rare and beautiful coastal assets. And, we’re taking what we’ve learned in Illinois and rolling out a new ravine initiative in Cleveland, OH this summer. Stay tuned for ravine updates, and don’t hesitate to reach out with any questions! Learn more or get involved! Live in a ravine community? Interested in ravine revitalization efforts? Want to get involved or just learn more? Contact Ethan Brown, Resilience Coordinator here at the Alliance for the Great Lakes.